Causation in Australian shareholder class action claims based on contravention of the continuous disclosure regime and misleading conduct remains an unresolved issue. In Halliburton Co v Erica P John Fund Inc 134 S Ct 2398 (2014) the Supreme Court of the United States reconsidered the fraud on the market presumption created in Basic Inc v Levinson 485 US 224 (1988). The reconsideration is instructive for Australia as the economic theory underlying the presumption is a component of suggested tests for causation in Australian shareholder class actions that do not require direct reliance. This article explains the decision in Halliburton and examines how the reasoning of the Supreme Court of the United States may impact the development of causation requirements in Australian shareholder class actions. A bank guarantee has traditionally been viewed as a cash equivalent. This view is supported by the operation of the autonomy principle. However, the autonomy principle is subject to certain recognised exceptions both at common law and under statute. One of these exceptions is commonly referred to as the negative stipulation or underlying contract exception. In recent times the operation of this particular exception has given rise to a wealth of case law. This article examines whether this recent case law appropriately recognises the reasonable expectations of the beneficiary of a bank guarantee that a bank guarantee should function not only as a security but as a risk allocation device. Cartels harm competition and welfare in each country in which cartelists fix prices, limit output, divide up markets, or engage in other anticompetitive conduct. To ensure Australian competition and welfare are not harmed by cartels, our laws must be expressed in language that is clear, concise and effective, and they must apply to cartel conduct engaged in outside Australia where it has an adverse effect on Australian competition or welfare. The existing cartel laws have proven difficult to comprehend and enforce, because of their verbose language and mind-boggling complexity, and the carrying on business requirement for conduct outside Australia to be relied upon is anomalous, and presents an expensive and unnecessary hurdle to Australian citizens complaining of the effects in Australia of conduct engaged in outside this country. The Harper Review’s proposed simplification of Australia’s cartel provisions is a welcome start in the right direction, although in need of refinement. Its suggestion that Australian laws apply to conduct engaged in outside Australia where it relates to trade or commerce in Australia needs reconsideration, for it is too broad a connecting factor. This article critically examines the proposed test, with reference to the tests adopted in Europe and the United States. 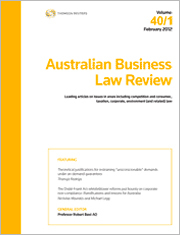 This article examines the role of economic analysis in competition matters, by reference to the case of Rural Press Ltd v Australian Competition and Consumer Commission (2003) 216 CLR 53. The article examines two different economics approaches to the case, and applies these approaches to the findings of fact made by the trial judge. The application shows that the High Court’s interpretation of the conduct of the parties in Rural Press was accurate. Rural Press was a case which involved active collusion by two willing competitors in contravention of s 45; it was not a case involving a unilateral misuse of market power under s 46. It is now routine in Australian commercial practice for documents to be sent out for signing by email, so that parties can sign the documents in separate locations rather than come together for a formal signing ceremony. Even though this is common practice, however, there is little consensus among practitioners on what needs to be done to ensure the legal effectiveness of documents that are signed in this way. This can lead to last-minute disagreements on what is required, or result in documents being signed in a way that may not satisfy the relevant formal requirements of Australian law. A group of Australian law firms has agreed on a set of protocols for the conduct of remote signings, in order to simplify the process of remote signings for transactions in which they are involved. This article explains what those protocols are. The legal analysis that sits behind the protocols will be the subject of a follow-up article in a later edition of this Journal. For the PDF version of the table of contents, click here: Westlaw AU – ABLR Vol 43 No 6 Contents or here: Checkpoint – ABLR Vol 43 No 6 Contents.